One of the most unusual and technically intriguing watches that I’ve seen so far this year at the 2015 edition of the SIHH is the Zeitwerk Minute Repeater. 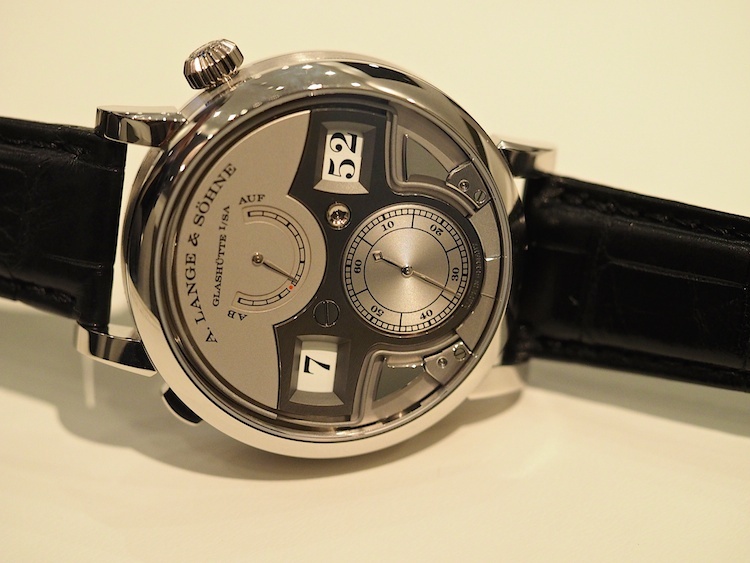 The Zeitwerk Minute Repeater is actually not Lange’s first minute repeater –that distinction goes to the Lange Grand Complication, which is a grand et petite sonnerie, minute repeater, with foudroyante rattrapante chronograph and perpetual calendar with instantaneous jumping indications for the calendar. The Grand Comp (if I may employ loose, watch-guy vernacular) is also an extremely rare beast and with only six to be made, at the space-time blistering speed of about one per year, it is not something apt to enter even the most elevated realm of collector discourse as anything to be actually experienced. No, the Grand Comp is one of those watches that was no sooner introduced than it passed into the realm of legend, and for mere mortals like myself (and probably you) it will remain forever a rumor heard as if from afar. 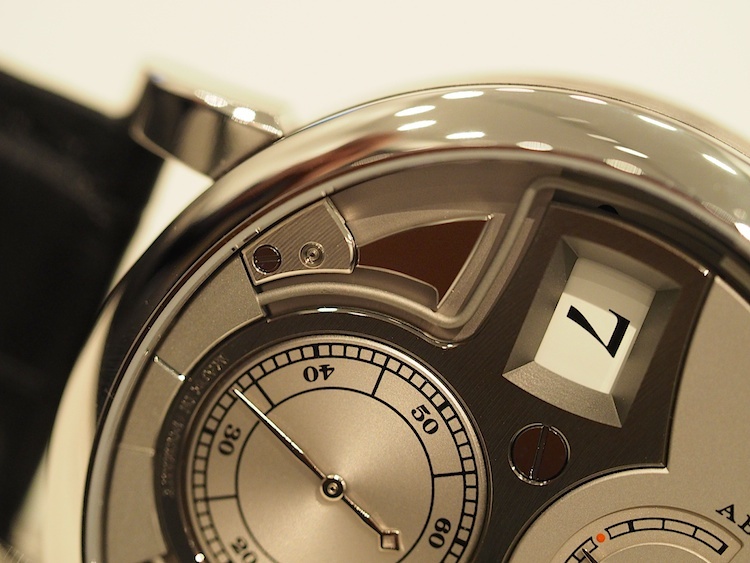 The Zeitwerk Minute Repeater, on the other hand, is going to be a regular production piece, and while the Grand Comp is an extremely traditionally constructed watch (albeit one with a lot of small tweaks to its traditional watchmaking solutions, intended to make it generally more reliable, durable, and robust) the Zeitwerk is pretty ground-breaking. The Zeitwerk Minute Repeater is a so-called decimal repeater: that is to say, it chimes the hours on a single gong, and then each ten minute interval after the hour on two gongs –ordinary minute repeaters chime the quarter hours –and then the minutes. Decimal repeaters are quite rare; I’m aware of only two others. One is Kari Voutilainen’s decimal repeater, which was introduced in 2005, and the other is the Seiko Credor Spring Drive Minute Repeater. You will sometimes see the term “decimal repeater” in reference to repeaters made just after the French Revolution –these are repeaters that keep time according to the Republican decimal time-keeping system, which had 10 hours per day, 100 minutes per hour, and 100 seconds per minute –but these are different from the modern decimal repeaters, of course. 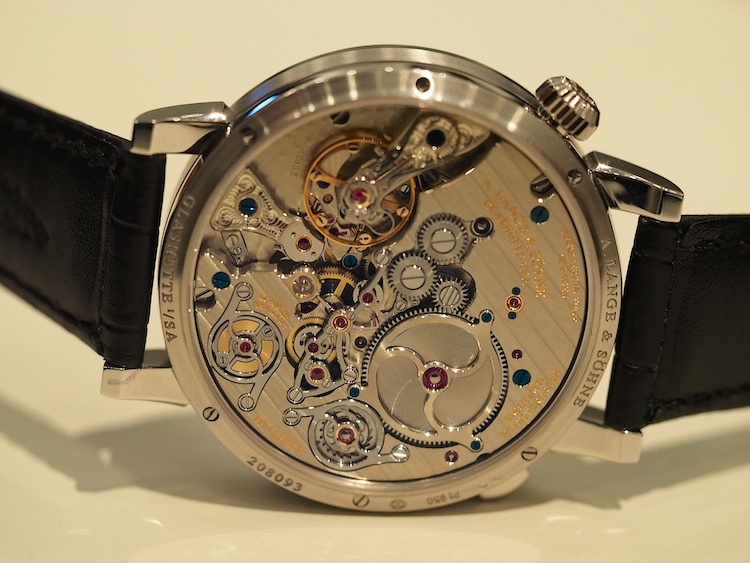 The Zeitwerk Minute Repeater’s construction is very different from that of most other repeaters. 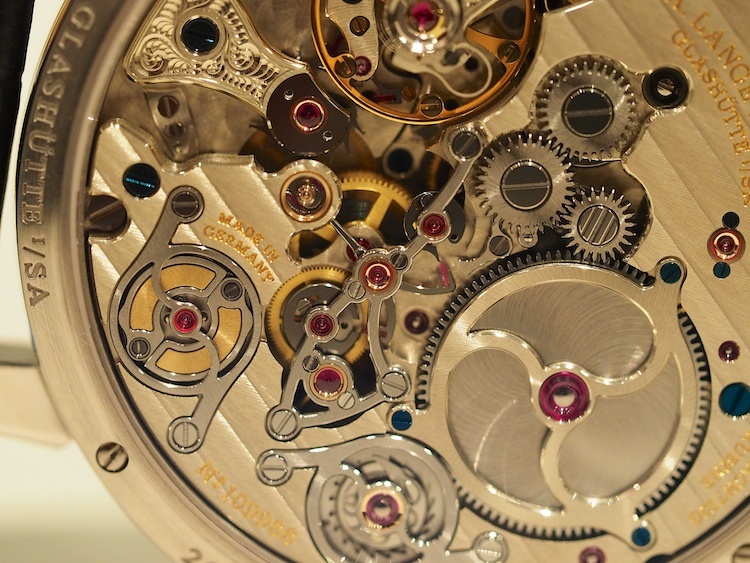 In general minute repeaters “sample” the time from the motion works of a watch –that is, the gears that determine the position of the hands. The Zeitwerk, on the other hand, has no hands –instead, it uses a system of rotating disks. The Zeitwerk Minute Repeater, therefore, has to have its repeating works constructed so as to allow the snails and racks for the repeating system to sample the time from the positions of the disks. 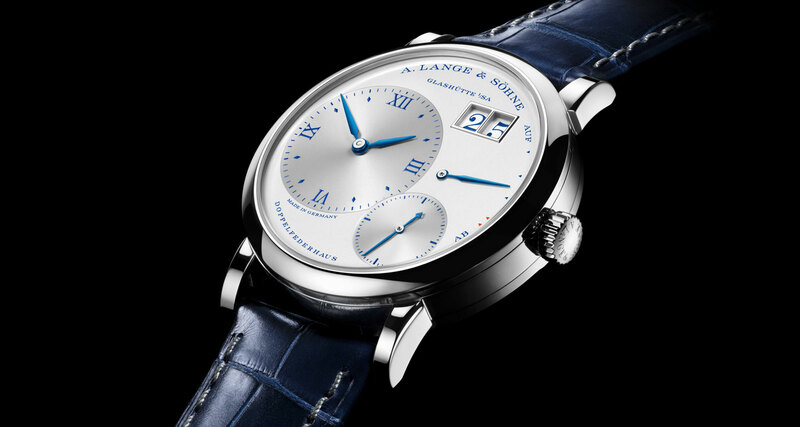 One of Lange’s most important objectives was to ensure that “what you see is what you hear,” –it takes up to 20 seconds for a full strike of the time (at 12:59) and in such a circumstance it might happen that the ones minute indication might jump before the strike is completed (that is, that while 11:55 is striking, for instance, the time changes to 11:56.) To prevent this Lange has constructed a blocking mechanism that prevents the ones disk from jumping until the strike is completed. Another interesting feature of the watch is the power supply for the repeater. Ordinarily a repeater strike is powered by a separate spring barrel that is wound when the repeater slide is pulled down. The Zeitwerk’s movement, however, would not have allowed the addition of such a barrel without making the movement undesirably large. Lange, therefore, chose to draw energy from the (very large) mainspring barrel driving the going train. 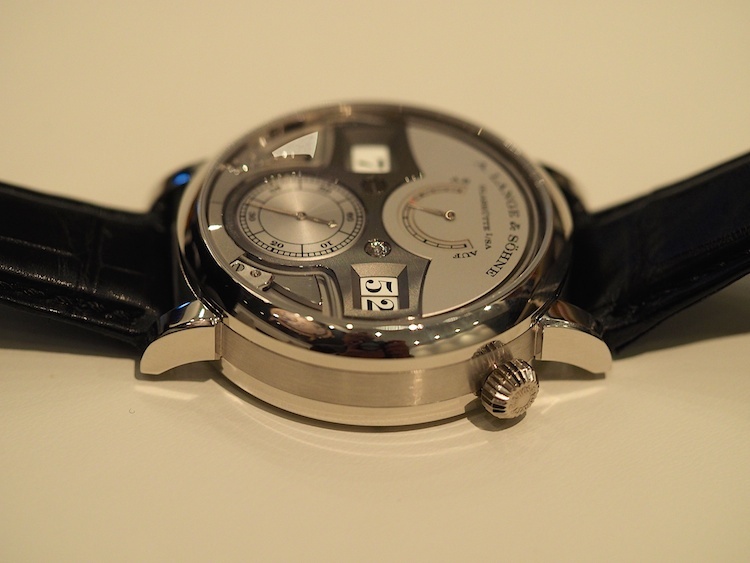 As the Zeitwerk has a train remontoire to ensure an unvarying supply of torque the operation of the repeater doesn’t adversely affect timekeeping; however, operation of the repeater does drain energy from the mainspring and if the power reserve drops too low, another blocking mechanism prevents the repeater from being activated by its pusher. There’s a very tasteful little red dot on the power reserve indication to show when energy’s run too low for the repeater to strike –if the watch is full wound, it takes exactly 12 strikes of the hour 12:59 to run the mainspring down to that point. It’s a wonderful achievement. 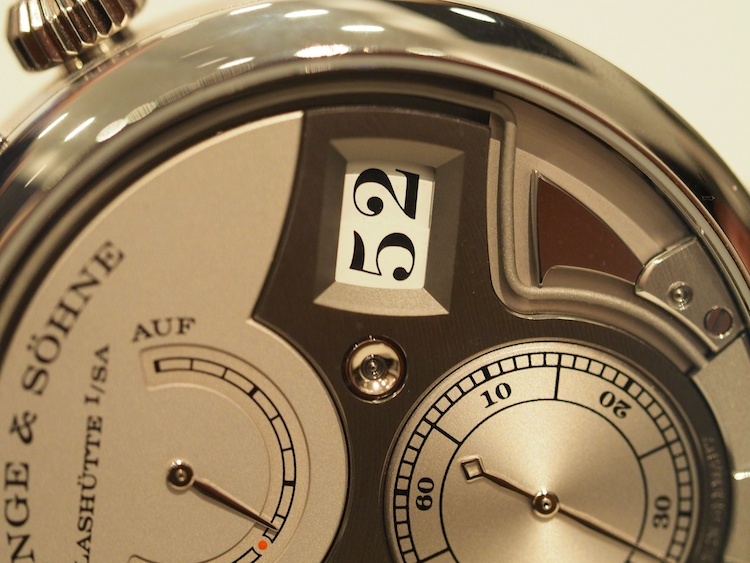 While the Grand Comp has an augustan hauteur in the face of which one can only bow low, the Zeitwerk has an intellectual interest –as well as a very idiosyncratic and completely Lange-esque charm –that makes the Zeitwerk seem immediately more approachable (well, as much as a 440,000 euro watch can seem approachable) and though the Grand Comp will forever remain a testimony to Lange’s prowess in the past, the Zeitwerk Minute Repeater is fresh evidence of its ability to create watches of both enormous ingenuity and imagination.